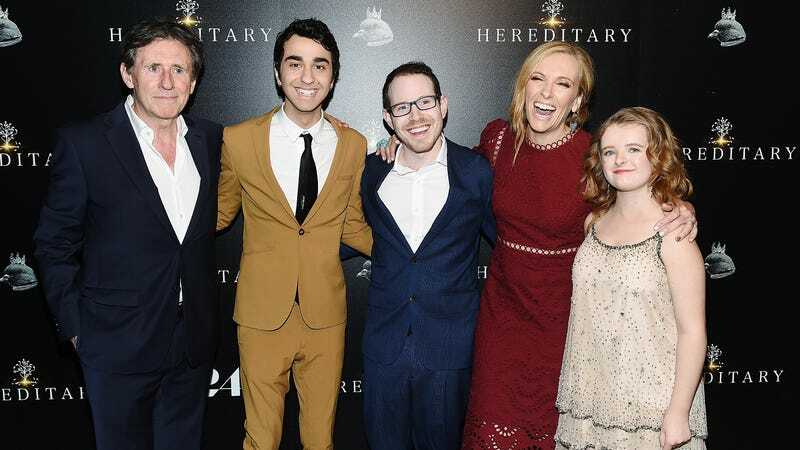 Ari Aster (center) with the cast of Hereditary. Why are they smiling. As we’ve sat here obliviously twiddling our thumbs, director Ari Aster’s been in Hungary plumbing the depths of trauma-laden depravity for his Hereditary follow-up, which /Film reports just got an official release date. A24 has revealed that the director’s highly anticipated sophomore feature will arrive on August 9, 2019. And, yes, it will be scary. Aster’s previously offered a few hints about the film, which he’s described as “Scandinavian folk horror” and an “apocalyptic breakup movie.” It reportedly follows “a couple that travels to Sweden to visit their friend’s rural hometown for its fabled mid-summer festival.” Unsurprisingly, “what begins as an idyllic retreat quickly devolves into an increasingly violent and bizarre competition at the hands of a pagan cult.” Hoo boy. Sing Street’s Jack Reynor and Lady Macbeth’s Florence Pugh will star alongside Will Poulter, Vilhem Blomgren, William Jackson Harper, Ellora Torchia and Archie Madekwe. Aster’s referred to the project as Midsommar in interviews, and it’s currently listed as such on IMDB. Aster also told The Hollywood Reporter in June that this is the only other horror movie he hopes to make “for a long time,” noting that he wants to “play in every genre.” Rest assured, though; if his early shorts are any indication, Aster’s got the capacity to pummel your heart in his special way no matter the approach.